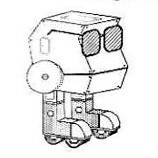 Just after the Macintosh came out there was a rumor about a programmable robot game called Chipwits that was coming out within year one. It sounded great to me and I was an early buyer of Chipwits. 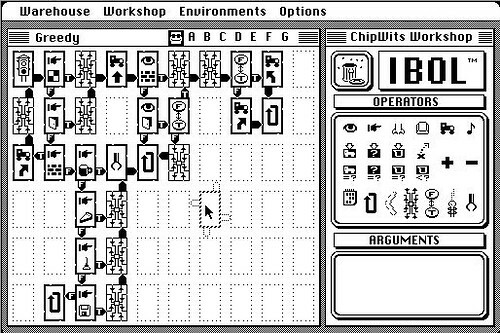 Chipwits was one of those hard to describe applications: sitting on the fence between game, simulation, and programming instruction. As soon as I got it and ran it (from disk, of course) I realized that what sounded cool was going to take a bit of time to learn. 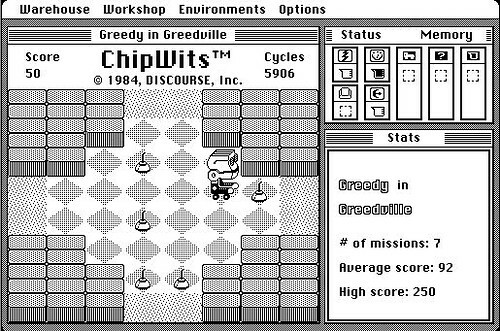 Chipwits consisted of a number of “environments” or rooms with different layouts and different obstacles. The object was to program the chipwit to navigate the room, zapping bugs, eating pie, and turning when necessary before his energy level ran low. The programming was done, in typical Macintosh fashion, by dragging tiles around into logic arrays, then saving them and running the chipwit in a room. This was an interpreted environment so if the chipwit ran into problems a few clicks and you were back in his brain futzing with his logic. What was great about this application was that it was hilarious while at the same time challenging and fun. Chipwits was soon out of sync with the Macintosh world as more powerful programming languages supplanted MacForth and the program grew incompatible with newer systems. I like to think of Chipwits as my pre-HyperCard warm up with amateur programming. It was also a load of fun and as I remember it, a number of people in the Eugene Macintosh users group got deeply into it along with me. Wow, 20 years is a very long time. I loved ChipWits! I can’t have been more than 11 years old back then, and this was amazing software. I have found a Windows remake that is *very* true to the original and it’s great fun to start all over again. Kids these days have no idea about old-skool computing, way back when actual *gameplay* was more important than *effects* (because there were none, with the exception of superior sound). What (my brother) Torben is referring to is Klaus Breuer’s version — which I’m trying to obtain the source code for. He said it was available upon request, but he’s been ill for some time and I suspect he has passed away. 😦 If anyone has the source, please contact me and/or update the wikipedia Talk page for ChipWits.